Author’s Note: This is a sponsored post written by me on behalf of Skout’s Honor. All opinions are 100% mine. I had never been so excited to try out a cleaning product before! Yet there I was, tearing into a package from Skout’s Honor to do just that. Why was I so eager to start spraying this stuff on my floor? Because my cat had just made a mess. The timing couldn’t have been more perfect. But beyond that, I had been doing some reading about Skout’s Honor, and I was loving the fact that I had discovered a nontoxic, eco-friendly, cruelty-free, pet-safe line of cleaners and deodorizers. And, as if that wasn’t enough, the company’s Paw Pledge™ is to donate a day’s worth of food to a shelter animal every time you buy one of its products. Oh — and this stuff may have saved my marriage. My cat, like most cats, occasionally has an accident outside her litter box. My wife, Julie, will yell out something about there being a “dude” on the floor in the hallway. “Hey, there’s a dude on the floor in the hallway!” she yelled out the very day my Skout’s Honor package arrived in the mail. I walked over and inspected the little turdlet. This thing looked fresh, slick even. This wasn’t going to be a simple grab-and-go. So of course I opened the box and pulled out Skout’s Honor Urine & Odor Destroyer. Right there on the bottle, there’s a bold declaration that this extra-strength product “quickly removes cat urine, vomit, hairball, feces, marking scent, spray stains and odors.” Yup, this ought to do the trick, I thought as I sprayed the floor. Don’t worry: I won’t show the actual “dude.” But this was indeed the scene of the crime. I wiped up the mess with ease, tossed the evidence into the garbage, then did another spraydown and wipe for good measure. I was surprised by how easily the cleaner not only had lifted away the stains, but also eliminated the odor. A few days later, I tried it out on a small chocolate stain on our couch, with the same great results. Skout’s Honor says its products work so well because they’re backed with a proprietary, non-enzyme (meaning no pretreatment is required) BioKore™ technology and a molecular deodorizer. 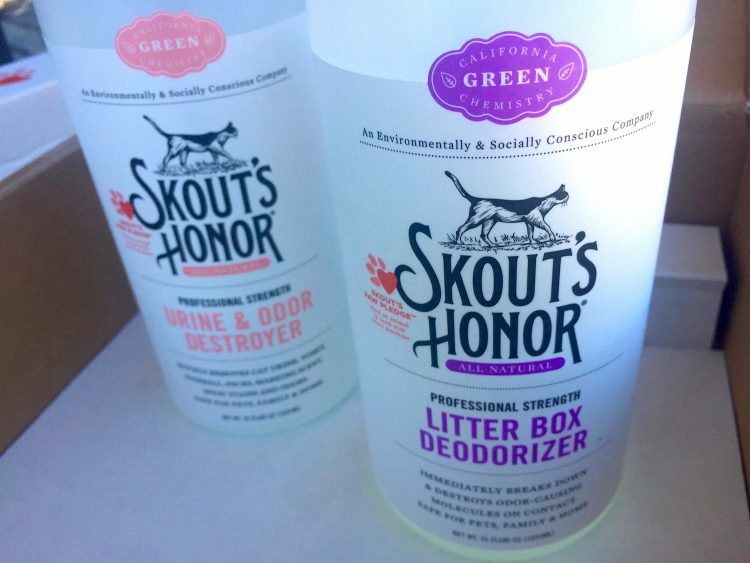 In fact, Skout’s Honor is “the most powerful option on the shelf for easily and quickly eliminating stains and odors for good,” the company explained in a handout that was tucked into my box. YECH! How did such a foul odor come from such a tiny cat? The other product I received for review was the company’s Litter Box Deodorizer. It, too, contains a molecular deodorizer — which means it targets specific odor molecules found in and around litter box environments, breaks down those molecules, and then proceeds to destroy them like nobody’s business. It doesn’t just mask the odors, and it works instantly. Fellow cat people, you know what I’m talking about when I say that sometimes our cats can really, and I mean really, cause a stink. God bless her tiny little heart — but this pint-sized, not-quite-7-pound cat can create the most monstrous of odors sometimes. Maybe it’s the salmon canned cat food she gets some days. I use a wonderful flushable litter, so at times like this I leap into action and scoop the offending feces and flush it away forever. But that odor would always linger for a while. Until now. 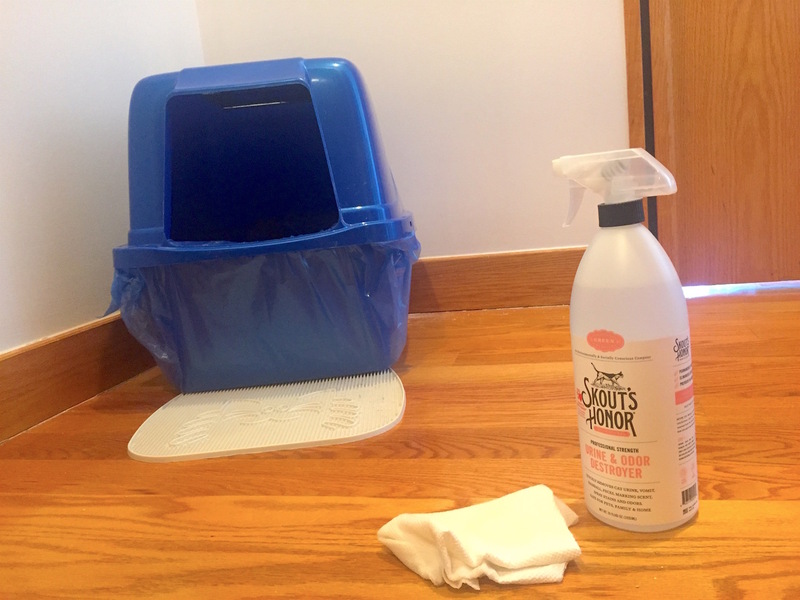 Thanks to Skout’s Honor Litter Box Deodorizer, I simply spray the air as well as inside the litter box — and the odor goes away, right away. It’s my new little miracle in a bottle. I love that I don’t have to spray some toxic or super-perfumy substance to accomplish this, either. Again, this deodorizer doesn’t just cover up the odor; it destroys it. This is a company I can get behind. Here’s where to buy. Now, my cat would never forgive me if I insinuated that she was the only one in our household creating vicious odors. Ahem. 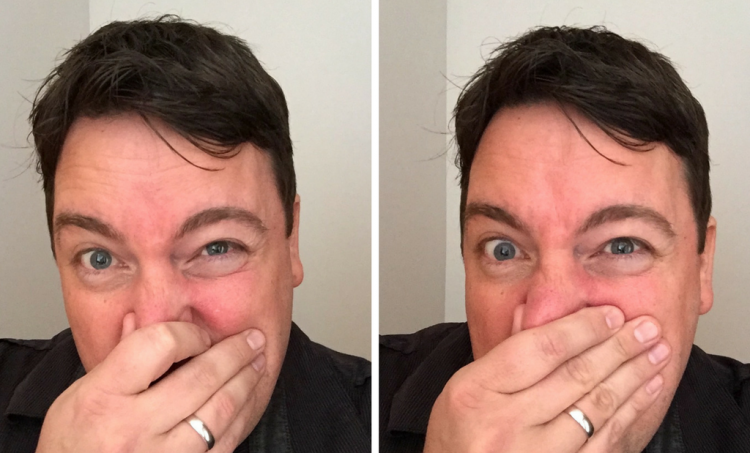 Well … I myself am another cause of occasionally ghastly bathroom odors. (Oh, you know your boyfriend or husband is the same way.) Anyway, I’m happy to report that the Litter Box Deodorizer works very well on human bathrooms. I believe it has saved my marriage as a result! Well, I mean, not literally. But Julie and I had just moved into a fairly small apartment that has no window in the bathroom, meaning those odors linger for an absurdly long time. Now that Skout’s Honor has entered the picture, I don’t have to worry as much. No need to pray — just spray and walk away. Each purchase provides not just a single meal, but 3 meals — a whole day’s worth — to an animal in need. 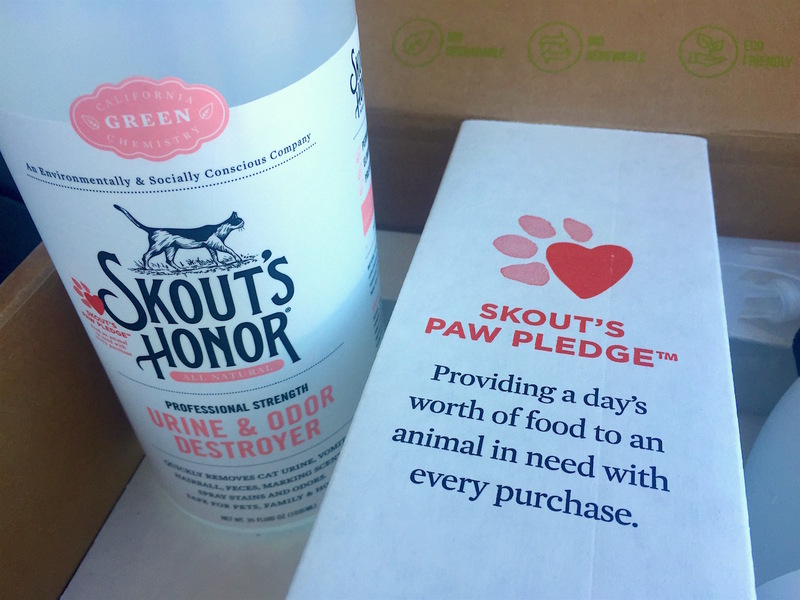 Now, about that Paw Pledge™ — I love that Skout’s Honor gives back like this. It fits right in with our own mission here at Petful. If you love the idea of supporting a company like this as much as I do, give Skout’s Honor a try. Browse the website, and you’ll see there are products not only for people with cats, but also for those with dogs. And, again, the products are so versatile that you can use them every day in applications that have nothing to do with pets. For example, I hear they work really well on tough stains on kids’ clothes and even wine or coffee stains. You can learn more here.